NASA’s InSight lander takes a selfie – this is what it looks like on Mars (InSight is the abbreviation for Interior Exploration using Seismic Investigations, Geodesy and Heat Transport). With its solar panels deployed, InSight is about the size of a small bus. InSight lander was launched on 5 May 2018 at 11:05 UTC aboard an Atlas V-401 rocket. It traveled 483 million kilometers (300 million miles) in almost six months and successfully landed at Elysium Planitia on Mars on 26 November 2018 at 19:52:59 UTC with the main objective to detect seismic activity. InSight lander opens a window into the “inner space” of Mars. Its instruments peer deeper than ever into the Martian subsurface, seeking the signatures of the processes that shaped the rocky planets of the inner Solar System, more than four billion years ago. InSight’s findings are expected to shed light on the formation of Mars, Earth, and even rocky exoplanets. This is a resized image. You can see the original image on the NASA Astronomy Picture of the Day (APOD) website. The featured selfie above is a compilation of several images taken of different parts of the InSight lander, by the lander’s arm, at different times. SEIS, the orange-domed seismometer seen near the image center last month, has now been placed on the Martian surface. 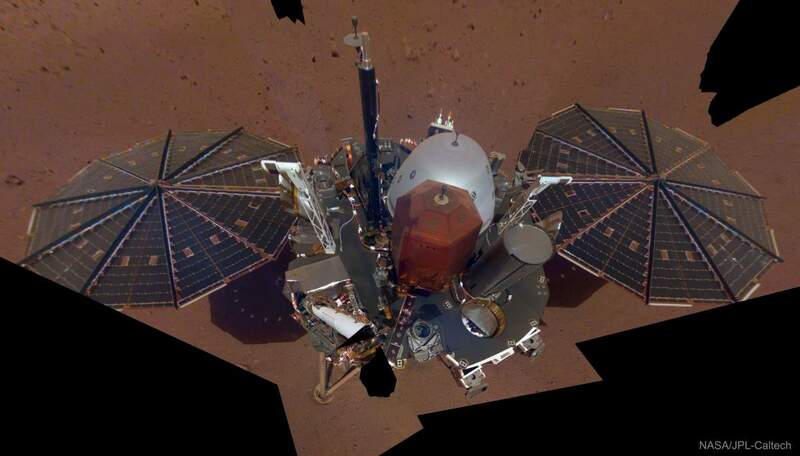 With this selfie, Mars InSight continues a long tradition of robotic spacecraft on Mars taking and returning images of themselves, including Viking, Sojourner, Pathfinder, Spirit, Opportunity, Phoenix, and Curiosity. Data taken by Mars Insight is expected to give humanity unprecedented data involving the interior of Mars, a region thought to harbor formation clues not only about Mars but Earth. InSight’s primary objective is to study the earliest evolutionary history of the processes that shaped Mars by detecting seismic activity. By studying the size, thickness, density and overall structure of Mars’ core, mantle, and crust, as well as the rate at which heat escapes from the planet’s interior, InSight will provide a glimpse into the evolutionary processes of all of the rocky planets in the inner Solar System (Mercury, Venus, Earth and Mars) which share a common ancestry that begins with a process called accretion. As the body increases in size, its interior heats up and evolves to become a terrestrial planet, containing a core, mantle and crust. Despite this common ancestry, each of the terrestrial planets is later shaped and molded through a poorly understood process called differentiation. InSight mission’s goal is to improve the understanding of this process and, by extension, terrestrial evolution, by measuring the planetary building blocks shaped by this differentiation: a terrestrial planet’s core, mantle, and crust.